Reports in last weekend's Sunday Times newspaper in the Western Australian capital Perth suggest that the grand finalists from this year's WAFL (Western Australian Football League, the state league feeding into the West Coast Eagles and Fremantle Dockers) will play an exhibition match in the Indian city of Mumbai (Bombay) the weekend after this year's AFL grand final. Also mentioned in the article is the possibility of Perth hosting the 2008 International Cup, although this is still at the rumour stage. A push is on for Perth to host the Australian Football International Cup in 2008. In a major boost for WA football this years (2005) WAFL Grand Finalists seem certain to play an exhibition match in Mumbai (Bombay), India, a week after the AFL grand final. Another overseas game, possibly to South Africa, is on the agenda for next year. WAFL General Manager Grant Dorrington said negotiations for the Mumbai match were advanced. "We looked at getting a game up there previously but were not able to do so" Dorrington said. "But we are very keen for it to take place late this year and are confident that will be the case... From the WAFL`s point of view we are terribly keen to grow the game and matches in India and South Africa would aid us in that endeavour". Melbourne has been home to the only two Australian Football Championship International Cups in 2002 and again this month, where NZ defeated PNG after 10 countries played over five rounds. Sports Minister Bob Kucera wants WA to host the Championships and is keen to take the game to South Africa in 2006, where the sport relationship between Australia and the Republic has grown after the inclusion of the Western Force in the Super 14 Rugby Union comp. "We are interested in the Championships, very much so" Kucera said. "If the WA Football Commission wants to bid for that, we will be very strong in our support. I have already spoken to Andrew Demitriou and Ron Evans and others about it." "Apparently the AFL game development department want the championship - which is expected to feature more countries than the first two titles - held in Perth. Last month the ten countries battled it out in Melbourne . The grand final was played as a curtain raiser before the MCG showdown between Carlton and Collingwood". "Not only would the Championship be a boost to the economy here in Perth, it would be a great showcase for Australian Rules" Kucera said. "I am a huge believer that one way for Australian Rules to flourish is to create international competition. I have only recently returned from South Africa and there are 16 Australian Rules football teams in the North West Province and Gauteng, and there is great enthusiasm for the sport in the townships". To capitalise on the growing interest, Kucera would like to see an exhibition game in South Africa next year (2006), possibly between the WAFL grand finalists again. He would like the game to be played in Cape Town—which hosted the AFL pre-season match between Fremantle and Brisbane in 1998—Or the Eastern Cape. Kucera intends to send a high-powered delegation to South Africa in October or November to try and tee up such a game. These are fantastic ideas from the Sandgropers! I would definately travel to Perth to see the World Cup. Maybe this would wake up some football spoilt Victorians, and I think it would be a great thing for WA. Hopefully this is more than a rumor, because I think the people of Perth would get right behind it (I'd expect nothing less than a bumper crowd for the upcoming International Rules in Perth and recent Rugby Union internationals have drawn big crowds in Perth). They seem to be a bit more openminded than Victorians about the game. I think they'd get many people from SA and Vic coming across to see the World Cup if it was hosted there, as I'm sure the WA government would put more effort into interstate promotion than the AFL/Vic government did here. As for the it is great to see some local leagues thinking outside the square to promote the game in their neighbouring regions. Of course, people from India wouldn't be able to tell the difference between a top-level AFL game and West Australian sides. The standard is lightyears above what they would have ever seen if anything, and with the right promotion could do really well. More frequent exhibition games is just what the game needs, and it would be great if other state leagues could do something similar, as the AFL seems to have capacity for a couple a year, and it is too big world to cover for one league. It would be a good strategy for the AFL to carve the world up into regions and delegate them to state based AFL clubs and state leagues to use them as exclusive feeders (Queensland - PNG, Samoa; NSW - New Zealand; WA - South Africa, India etc. ), and give state leagues extra impetus to run their own promotions to grow the game internationally and at the same time enahnce the quality and grass-roots footy in their own states. Already happening to some extent. 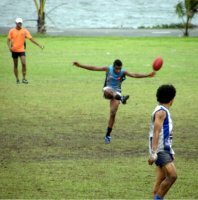 PNG already is 'zoned' to Queensland - the PNG juniors compete in the Queensland state championships and they are planning matches against the Cairns AFL and such. New Zealand are going to start competing in the Victorian Country Football League interleague series against the rep sides from the various Victorian country leagues. (Can't remember if we've officially announced that yet - but it's in motion). To follow on from your comments (sean & aaron). NZ have enough quality U/16's & U/18's now to join into the "B" Division of the Australian Championship's (along with Tassie, Queensland, NSW/ACT and NT) and in fact it is a part of their Development Plan.This is an area that should be pushed as it will no doubt produce future AFL STARS and then and only then will the AFL CLUBS feel like they are getting something from International AFL. Back in 2002 they beat a state ACT team in a U/16s tournament in Canberra. Some of those boys are as good as any Aussie kid. I know it's pie in the sky stuff now, but don't be surprised to see a relocated AFL side based in Auckland, NZ within ten years or so. Only 3 Hours away from Melbourne, 1.2 million people, plenty of money, brand new market & sponsors. If there's a Western Force in Perth, what about a far Eastern Bulldogs in Auckland ? I had heard that a few years ago - Colin, with your connections to NZ do you know what stage that's at? As for an AFL side in NZ, it's possible, but I think even if someone had to relocate they'd be more likely to head to Canberra, Darwin, Tassie or maybe the Gold Coast or Western Sydney before NZ. We'll see though, it's always a possibility. I'm a big pusher for the games growth overseas and Auckland may well be a possibility for an AFL side but I still think we need to fix up things at home first. 10 teams in Victoria is unsustainable. You should probably discount Geelong and say 9 Melbourne sides but the issue is still the same. We need to reward fans on the Gold Coast in Darwin and Tassie and break into new markets (West Sydney, Canberra and - I don't know why it's never mentioned as it has a large population but also - Newcastle). An expanded 18 team competition. Two introductions and several relocations. 5 teams in Melbourne, 1 in Geelong, 2 in Adelaide, 1 in Perth, 1 in Fremantle, 1 in Darwin (with the possibility of one game played in Alice Springs) 1 side in Brisbane, 1 on the Gold Coast - possibly the promotion of Southport, 2 in Sydney, 1 in Canberra, 1 in Newcastle and 1 in Launceston with a couple of games played in Hobart. That is obviously dramatic and would only be possible over a large time frame but the AFL must take a serious look at its structure if it wants to remain a truly national competition. I suppose the main argument against reductions in the amount if teams in Victoria surrounds the concern as to whether supporters would cease following their team if it was rellocated. The short answer is probably yes, but then look at Fitzroy and South Melbourne supporters in Melbourne. Even if the AFL did undergo temporary crowd loss it surely wouldn't affect the next generation (how many kids follow their parents footy teams?) and as a Kanagroos supporter living in Melbourne not only do I accept a permanent move to Canberra but endorse it. Finally the Victorians are UNDERSERVING of 10 teams. The reason State of Origin went under was largely due to Victoria's poor attedances and now they cry poor. If they cannot support the game on an International level then why do they deserve to be the heartland of the worlds greatest game? I do not propose that the Grand Final leave the MCG because that is where it should always belong but other central issues surrounding football do need a shake up, especially so because of new threats such as the A-League. Just a last word; obviously all Victorians aren't unsupporting of football (for example I attended a few International Cup games) but some facets of footy can definitely be more successful interstate.